2 Sign in / register or simply checkout as a guest. 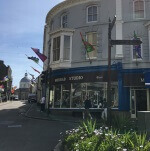 Morrab Studio in Penzance. Supplying quality gifts since 1950. Rondo Napkins at Morrab Studio. IHR Ideal Home Range is universally recognised as being the best napkin and tissue printers. Licences include Emma Bridgewater, The V&A Museum and Burleigh Pottery to name but a few. In addition there is a very wide range of IHR own designs. Based in North West Germany, IHR is a luxury tableware company, that is very eco-conscious. IHR designs their own products in house, and for the paper napkins, they work with selected artists. The Rondo napkins are 34cm /13" in diameter (unfolded) and come in packs of 12. They are mostly 3 ply in thickness and are printed using eco-friendly and food safe water based inks on the preferred industry standard FSC accredited paper. © 2005 - MORRAB STUDIO. All Rights Reserved.